When a chilly breeze lingers in the air and the kids head back to school, start preparing to winterize your above-ground pool. Readying the swimming pool for cool or freezing weather helps the above-ground structure brace for winter. Chemical treatments, cleaning, covering and storage of many of the pool's external components ensures the pool will host many future summer afternoon swims. Winterizing your investment will take a full day if you need to thoroughly vacuum the pool before starting the pool closing process. Balance the pool's water chemistry. Add chlorine shock to raise the water to 1 to 3 ppm of chlorine. Add pH increaser or pH decreaser to achieve 7.2 to 7.6 pH. Use a pool water test strip to verify the water chemistry. Backwash the pool one last time to flush debris from the sand filter. Turn off the filtration system and remove the external skimmer basket, pump, discharge plug on the filter and all hoses connecting the above-ground pool to the filter. Drain the pool so the water level rests 6 inches below the skimmer. Use a portable wet/dry vacuum with a long plastic hose attachment to remove water from the pool. Direct the flow to a nearby sewer drain. 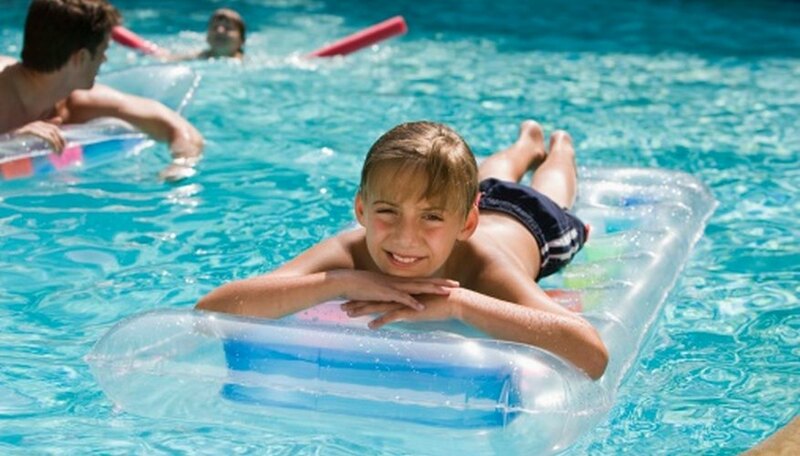 Inflate a pool flotation pillow equipped with an ice equalizer, using a bicycle air pump or a small air compressor. Float the pillow in the center of the pool. Stretch a winter-safe pool cover over the above ground pool. Lace the grommets around the perimeter of the cover with rope, pull the rope snug and clamp the cover so it can't blow off. Spray approximately 2 inches of water from a garden hose on top of the winter cover to weigh down the fabric so it won't tear from winter wind. Dry and store all pool toys, chemicals, pool ladders and cleaning accessories in a garage, tool shed or basement. Leaving these items under a deck or outside near the pool throughout the winter leaves them susceptible to damage from moisture, freezing and thawing, according to Red's Pool and Patio Showcase.